As far as beds go an emperor bed is a great piece of luxury for your home and can be one of the most expensive items you buy. As a very luxurious bed we're sure that its something you want to only dress in the finest fabrics. But as emperor bedding isn't exactly common on the high street this can be a task in itself. Victoria Linen make our bedding in house, because of this we have a great range of emperor bed linen for you to choose from, including a great range of large flat sheets made to fit. Our bedding is made from the finest 200, 400 & 1000 thread count fabrics and can be made to any length, width or depth making it a perfect fit for your emperor bed. 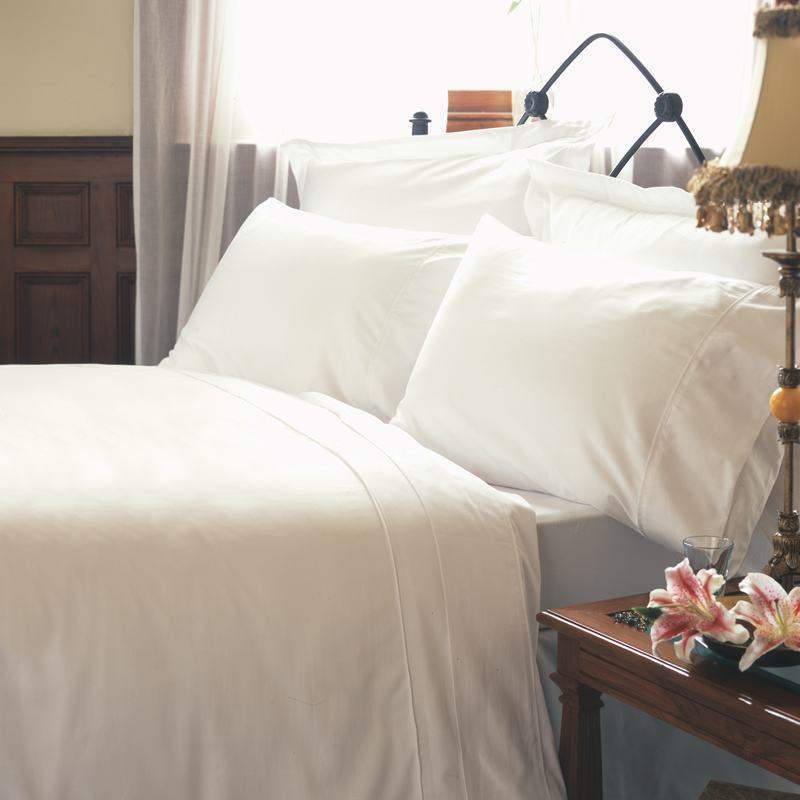 We only stock fine percale fabrics, ensuring you get bedding that is supremely soft whilst also being extremely strong and hard wearing, proving resistant to pilling and thread wear. Samples of any fabrics are available, just ask. If you would like these or want chat with us more please call 01706 220020, use the chat box below or drop us an email. Emperor Flat Sheet to fit 6ft 6in (200 x 200cm) Emperor BedsOur premier, ultra soft flat sheet in 10..
Emperor Flat Sheet to fit 6ft 6in (200 x 200cm) Emperor BedsA simple flat sheet, in 200 Thread Count..
Emperor Flat Sheet to fit 6ft 6in (200 x 200cm) Emperor BedsA luxuriously soft flat sheet in 400 Thr..
Emperor Flat Sheet to fit 6ft 6in (200 x 200cm) Emperor BedsA simple flat sheet, made to go on your ..
Emperor Flat Sheet to fit 6ft 6in (200 x 200cm) Emperor BedsMade in super soft 540 Thread Count Sati..
Emperor Flat Sheet in 1000 Thread Count CottonLuxury bed sheet made to fit 6ft 6in and 7ft bedsEmper..
Emperor Bed Sheet in 100% Cotton.Flat Sheet to fit 6ft 6in and 7ft Emperor beds.Emperor beds are a l..
Emperor Bed Sheet in 100% Brushed Cotton Flannelette.Super soft brushed cotton Flat Sheet for 6ft 6i..
Large Emperor Flat Sheet to fit 7ft (215 x 215cm) BedsOur premier, ultra soft flat sheet in 1000 Thr..
Emperor Flat Sheet to fit 7ft (215 x 215cm) Emperor BedsA luxuriously soft flat sheet in 400 Thread ..
Emperor Flat Sheet to fit 6ft 6in (215 x 215cm) Emperor BedsA simple flat sheet, in 200 Thread Count..
Emperor Flat Sheet to fit 6ft 6in (215 x 215cm) Emperor BedsA simple flat sheet, in soft, 200 Thread..
Large Emperor Flat Sheet to fit 7ft (215 x 215cm) BedsMade in soft 540 Thread Count Satin Stripe, 10..
Emperor Flat Sheet to fit 7ft (215 x 215cm) Emperor BedsA simple flat sheet, made to go on your matt..